The snappy green and red mitred conure is an exuberant, small-to-medium-sized parrot who loves to play, and who has the talent to become a good talker. This is a very active bird, curious about the world, comical, and eager to explore. But a mitred conure can also be somewhat temperamental and can be prone to nipping—and it will scream if denied the attention it wants and needs. This may not be a great bird for a beginner, an owner senstive to noise, or for an apartment dweller with nearby neighbors. Some owners, however, use mitred conures as "watch birds" due to their piercingly loud alarm calls. 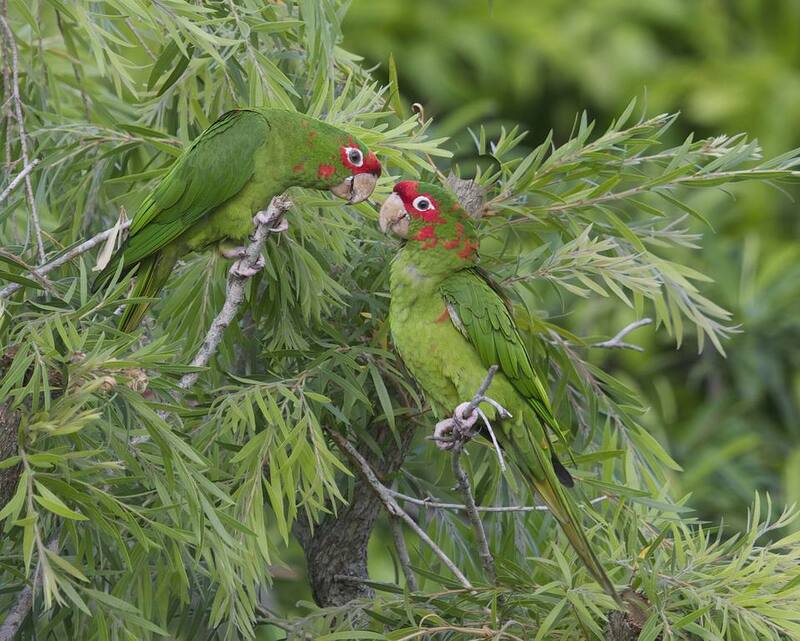 The mitred conure may also be called the mitred parakeet or the red-headed conure. The mitred conure is native to the South American Andes from north-central Peru, south through Bolivia to northwestern Argentina, where it typically inhabits forests at altitude from about 3,000 to 11,000 feet. Introduced populations are also found in California, Florida, and Hawaii, where they are sometimes considered a nuisance due to crop damage. The mitred conure is the second largest of all the conures, reaching an average length of 13 to 15 inches from the beak to the tips of the tail feathers. On average, adults weight about 7 ounces. When well cared for in captivity, a mitred conure can live 20 to 30 years. Tame, hand-fed mitred conures can make affectionate family pets when given plenty of love and attention. As with any pet bird, mitred conures have their moods, and like other conure species, the mitred can get nippy. For this reason, a conure is not the best pet for households with small children, but they can make quite good family pets in homes with older children who understand how to handle and respect birds. Generally, mitred conures who are well socialized and get lots of attention make attractive, fun-loving companions—albeit loud ones. The dawn and dusk periods may be very loud in a home where a mitred conure lives. Mitred conures are somewhat clownish by nature, and may perform tricks to gain attention. Mitered conures are therefore good pets for owners who enjoy lots of interaction with a pet bird, and are a rather poor choice for owners who do not have the time or inclination to place a pet bird at the top of the priority list. A mature mitred conure is mostly vivid green in color, with spots of bright red on the faces, heads, necks, and the top halves of the legs. It has a bare white ring around the eyes, with a horn-colored beak and gray feet. Males and females are identical in color. This bird is rather difficult to distinguish from its close relative, the cherry-headed conure, but the mitred is missing the bright red on the bend of the wing that is present in the cherry-headed. If you are interested in owning a mitred conure, always check with animal rescue organizations and adoption societies. Mitered conures are such loud birds that owners who find themselves unable to deal with the racket often give up their birds. Although aviary pet stores may carry the mitred conure, a bird breeder is usually a better option. A mitred conure needs a cage of substantial size—one with a 24-inch square footprint and 36 inches in height should be regarded as a minimum. Provide perches and plenty rated for strong chewers, and change them frequently to prevent the bird from getting bored. Mitred conures are athletic birds that should also have a playpen outside the cage. Mitred conures love to bath and should be showered with a spray bottle or under a sink sprayer regularly. Like all conures are intelligent parrots and are flock-oriented birds. They require plenty of mental stimulation to prevent boredom and the resulting behavior problems, and owners need to be prepared to fill in as the bird's flockmate. Bored or lonely conures may soon turn to biting, chewing, and screaming. Frequent and lengthy interaction time with human caretakers will prevent this. This interaction time is well spent teaching the bird to mimic words and phrases—this is one of the better-talking of the conures, and teaching it to speak is a good channel for your bird's substantial vocal energy. A bird that learns a lot of words is a bird that is less inclined to scream. Responsible owners must make sure that certain nutritional requirements are met. In the wild, mitred conures feast mostly on fruit, nuts, and seeds, but in captivity, they do best on a balanced, pelleted diet, supplemented with fresh fruits, vegetables, and nuts. As with all birds, proper exercise is imperative to a mitred conure's good health. Mitred conures are by nature very active and inquisitive, and they need to be provided adequate space to fly, explore, and play. Keeping this in mind, your mitred conure should be allowed adequate time out of his cage per day for supervised play time. Give your bird a minimum of four hours of free flight time out of the age each day in a space that is safe. Like all parrots, mitred conures need to chew and should be given plenty of sturdy play toys to gnaw on. This will not only channel the gnawing instinct but also provide exercise. Also, you might want to review our profiles of other medium-sized parrots.